I don’t know if it’s my age – but I’ve been struggling with a simple question lately that I used to have no trouble answering (no, not my name): if you had to buy one new bike this year, what would it be? In years past the response would have been swift, and almost unanimously followed the same pattern. I can recall my answers for every year since 1996, and there have only been three years of those 20 when the answer wasn’t a faired sportsbike. GSX-Rs and Fireblades, and my garage contents reflect that back-story. But here in 2016 I’ve found myself in a quandary. Power, acceleration, taut chassis and an underlying irreverence still underpin my desires, but I also want to go places, love the versatility of panniers, and don’t want to refuel every 100 miles. So when we first got wind of the Super Duke GT I started to feel the tingling excitement of expectation tugging at my nerve endings. 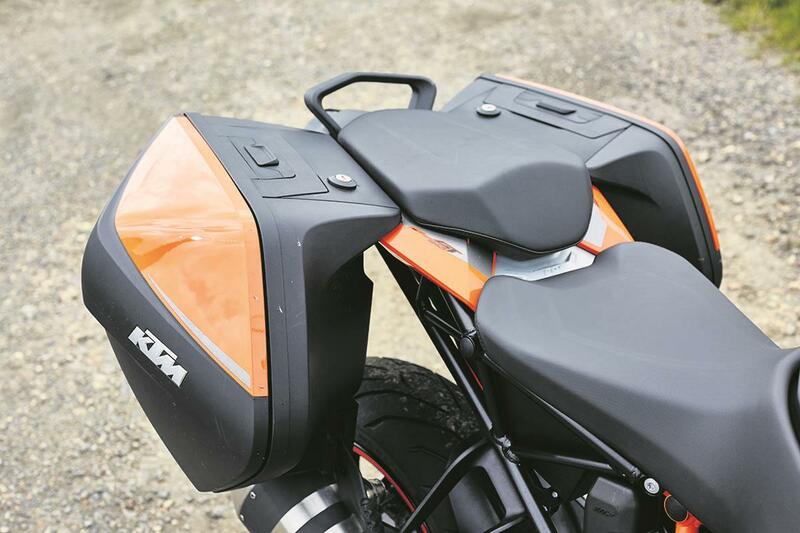 Super Duke R insanity, superbike manners and adventure-sports practicality – all blended into one. 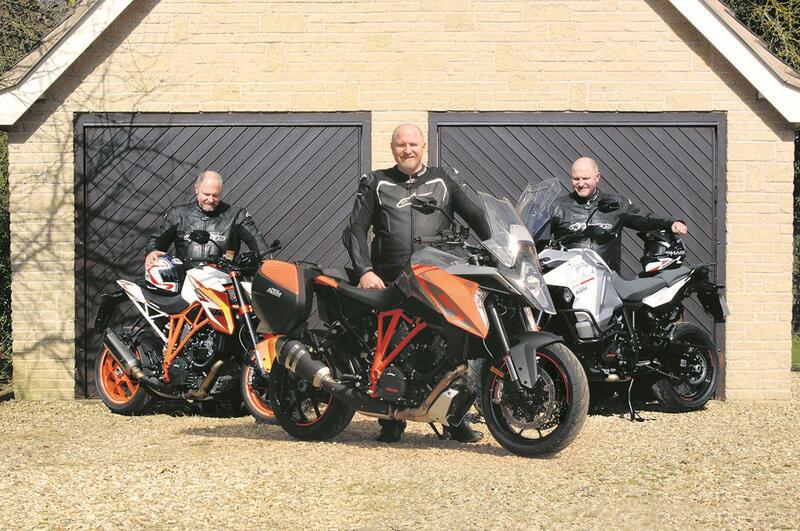 In preparation for its arrival I nailed a hedonistic 450 miles aboard the Super Duke R over the course of a week, before migrating to the other 1290 in the family, the Super Adventure. Six weeks and 2000 miles later I’d become rather attached to the behemoth’s endearing blend of superb comfort and bonkers performance. So much so that I was a little nervous of swapping it for the Super Duke GT. The GT certainly felt daftly compact after the SA, but instantly familiar. With just 24 miles showing on the odometer I couldn’t immediately explore its potential, but the surfeit of grunt from that 1301cc motor still couldn’t fail to impress. Just seven days later it went back for its first service, and I’m now revelling in the full experience. And while there have been surprises, they’re all positive. I was concerned about wind protection from the stubby and low front end, and you are exposed to a lot of windblast, but it’s free of turbulence and not intrusive or tiring on the move. The seat worried me, too. I might be endowed with plenty of my own padding, but the hard-looking perch has actually proved better over distance than the SA was. The riding position feels like it was designed just for me, and I can’t think of another bike I’ve felt more instantly at one with. But the two words persistently rattling around my head for almost every one of the last 658 miles are ‘precision’ and ‘hooligan’. The wide bars, effortless grunt, superb Pirelli Angel GT tyres, semi-active suspension, and a chassis you’d be happy with in a superbike mean it’s scalpel-like on the road. Whatever line you pick, it’ll carve it, and if you want to change line it’s instantly compliant. The contradictions of its hooliganism, comfort and practicality are hard to reconcile with one another – but it just works. 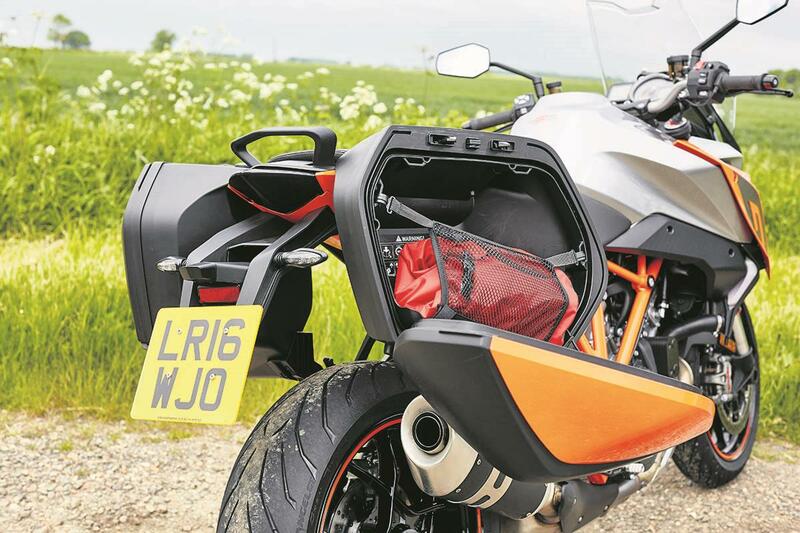 It’s the world’s first hooligan-tourer. The big questions now are all around durability and how it really performs when you’re bashing through hundreds of miles every day back-to-back. And I’ll have plenty of time to test both over the coming months. What goes up must also come down, and sometimes it comes off, too. The little arm that sticks out from the sidestand to facilitate flicking it up and down decided it’d had enough, and flicked off completely after just four days of use. It didn’t detach under foot, but had vanished at some point on the road between the office and home. Hopefully it’s not embedded in anyone’s tyre – I’m certainly grateful it didn’t ping into the GT’s. It’s not an isolated incident, this appears to be happening with most of the GTs that have been released into the wild. KTM will replace it, but HQ didn’t have one available when my bike was serviced. The other irritation was with the lock in the offside pannier, which decided to slide elegantly out of the pannier when I pulled the key out, spewing its tumblers and springs everywhere in the process. The problem is the large O-ring that sits at the head of the barrel, which needs a lot of compression to seat the barrel well enough for the sprung locking pin to deploy. This one hadn’t been squished hard enough, so it came out with the key. This was addressed at first service, and hasn’t been a problem since.